What could we possibly be celebrating today, on the Ascension of our Lord? According to the Acts of the Apostles, “When [Jesus] had said this, as [the Apostles] were looking on, He was lifted up, and a cloud took Him from their sight” (Acts 1:9). He vanished! He disappeared! He’s gone! What could possibly be worth celebrating about that? Well, at the Ascension, Jesus did vanish in a certain sense. After that day, He was no longer simply one Person in one physical Body among many in the world. He disappeared that day as a single individual in visible, incarnate form. But, in another sense, He actually became present that day. In the same chapter from Acts, Jesus tells us: “When the Holy Spirit comes upon you, . . . you will be My witnesses . . . to the ends of the earth” (Acts 1:8). In other words, as Jesus ascends to the Father, He promises to send the Holy Spirit upon us. And, when we receive the Holy Spirit at Pentecost, we become in a fabulous, mystical way the very Body of Christ. We, ourselves! From now on, those who want to see God, the Messiah, can no longer look to Jesus as He was when He walked the earth. 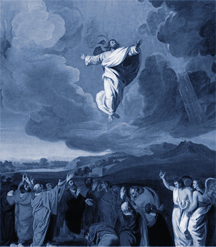 This is what the Ascension celebrates: not only Jesus’ physical Ascension into heaven, but our ascension to a new role. Today, we take on the unfathomable role of being the mystical Body of Christ—His visible presence in the world.